Good morning, sweet friends, and Happy Spring! This week, I am joining a group of very talented ladies for a Spring Tablescape Blog Hop hosted by the very sweet and talented Chloe at Celebrate and Decorate. Be sure and check out the other tables on the hop. There is lots of beautiful inspiration for your Spring and Easter entertaining. You will find a schedule of all the participants posted below. This year, I am so excited to be hosting Easter brunch at my house. Nothing makes me happier than setting a pretty table and preparing delicious food for the ones I love. During Christmas and Thanksgiving, we travel to both my parents and in-laws for the holidays. While I do enjoy this time, there is just something special about getting to be the hostess and share the holiday in your home. Every year, the Easter Bunny visits my house. While the kids are sleeping, he hides the eggs they dyed the night before and leaves special treats in their Easter Baskets. A lace tablecloth is used for the underpinning. For each place setting, I chose to use pink charger plates with Blue Italian Spode Plates. I could not find pink charger plates at my local store. Therefore, I decoupaged inexpensive charger plates with pretty pink fabric I had on hand. Blue and white French linens complete the look. I tied each napkin with a pink ribbon and tucked a sprig of Spring berries inside. Each place setting is accented by my favorite American Fostoria glasses. The small glasses are filled with little chocolate covered Easter eggs so that each guest will have something to nibble on while they visit. A sweet Easter Bunny graces the table with his presence and acts as the perfect centerpiece. He brings along his wheelbarrow filled with blue and white eggs. I hope that you have a Happy Spring, sweet friends. Thank you so much for visiting today. Have a wonderful day!!! Thank you! Hope that you are having a great week!!! Shannon, Your family is in for a treat visiting you for Easter. I love your bunny and wheelbarrow full of eggs as your centerpiece. What a cute idea to decoupage chargers to fit your theme as well as use the lovely pink ribbon as napkin rings repeating the pink from the bunny’s ribbon. You have used the design element of repetition and color so well.Texture makes your table intriguing too. That is the cutest wheelbarrow. I always enjoy your tables, Shannon. Thank you, Bonnie, for the very kind and sweet comments. It has been so much fun blog hopping with you! Your tables are always gorgeous! Happy Spring!!! Shannon, what a thrill for you to host Easter with your family. Your table setting is gorgeous…Spode blue and white works anytime, anywhere! May I say I am swooning over your charger plates, they are so springy and pretty…love them. Your blue and white eggs with the Bunny as the centerpiece says Easter is on its way! Beautiful job and I would love to be a guest at your table! Thank you, Pam, for the very sweet and kind words. It is always fun blog hopping with you. Your tables are always beautiful! Shannon, what a beautiful Easter Tablescape!! I love the bunny & wheelbarrow filled with eggs! Your blue & pink scheme is so pretty! Thank you, Michelle, for the sweet comment! I hope that you are enjoying your week!!! Happy Spring to you Shannon! You’re so smart and industrious to decoupage your chargers for your Easter table. I wouldn’t have thought to pair your blue Spode with the pink but it’s so pretty together and I love your blue and white eggs in your vine covered wheelbarrow! Thank you, Mary, for the sweet words. It is always fun to blog hop with you. Your tables are always beautiful! Happy Spring!!! I adore your rabbit and wheelbarrow! What a charming centerpiece!! Brilliant idea to decoupage your chargers to get just what you wanted. The entire scene says come dine with us, and welcome spring. Thank you, Carole! I hope that you are having a wonderful week! Happy Spring!!! OH Shannon, this is too adorable! That bunny with his flower covered cart of blue and white eggs is just the best! And the decoupaged chargers, swoon! I just bought a bunch of decoupaging supplies yesterday and can’t wait to get started, don’t be surprised if I borrow this fabulous idea from you…The napkins are just delightful too. I know your family will enjoy this beautiful breath of spring table! Thank you, Jenna, for such a sweet comment. I wish I would have invented decoupage. The possibilities are endless. I know whatever you make, it will be beautiful! It has been so much fun blog hopping with you! Happy Spring, sweet friend!!! Even though I have zero real blue and white in my decor, I absolutely love that classic look, Shannon. Your additions of the pink in the form of those decoupaged charges is brilliant! Love that bunny’s wagon on the tabletop with the blue & white eggs. You know, this tablescape could work really well for a spring baby shower too – not knowing the gender, but utilizing both pinks and blues. Very Springy! Thank you so much, Rita, for the kind words. It has been so much fun blog hopping with you! Happy Spring!!! Thank you, Morgan! I hope that you are having a wonderful week!!! Shannon, you have opened up a world of possibilities for chargers. I need to buy stock in Modge-Podge! This table is beautiful and I love that you used placemats along with those lovely chargers. Your bunny sits regally on a table that your family is really going to enjoy. Happy Spring! Thank you, sweet friend! It has been so much fun blog hopping with you! Happy Spring!!! What a sweet table. I just loved the bunny too. Thank you, Deborah! I hope that you are enjoying your day! Happy Spring!!! Love everything on your table…but please tell me about your beautiful pink plates that you decoupage for your chargers . I would love a tutorial on how you did it. Can those plates be washed? Inspirational!!!!!!!!!!! Thank you, Rosie, for the sweet comment. For the charger plates, I used some inexpensive Wal-Mart charger plates. I had some cotton fabric on hand. I simply cut squares of fabric to fit each charger and decoupaged them to the plate. After they were dry, I trimmed away the excess fabric. They ones I made cannot be washed, but there may be something at the craft store that you could seal the fabric with to make them washable. I am just going to spot clean the ones I made. I hope this helps. What a stunning easter tablescape.I love your doted napkins and the pink bows.Everything is just beautiful.It was nice blog hoping with you! Thank you, Fjolla! It was so much fun blog hopping with you, too! Happy Spring!!! How cute is that bunny?! I am so so envious of your china set and matching candlesticks. Thank you, Ariel, for the sweet comment! Happy Spring!!! Shannon, I love how you combined the Blue Spode dishes with the pink chargers, ribbons, and candles. And you made the chargers! I am so impressed. The bunny and the wheelbarrow are just precious. The pattern on the place mats is a wonderful complement to the Spode dishes. Just such a pretty table. i’m sure your family will enjoy a beautiful Easter dinner. Thank you, Carol, for the sweet and kind words. It always so much fun blog hopping with you! Happy Spring!!! Very daring combination of charger and plate…but I have to admit I really like it! Thank you, Nicki! Happy Spring!!! Lovely! I collect english transferware and I absolutely adore your tablescape: Spode’s Blue Italian is always perfect! Eggs are in china, too? Hi Donna! Thank you for your very sweet comments! The blue and white eggs are actually plastic eggs decoupaged with blue and white fabric. They are very easy to make. I am so happy that you were able to blog hop with us. It is always so much fun! I hope that you are enjoying your week! Happy Spring!!! Very nice tablescape. Please tell us more about those blue and white eggs! Thank you, RS! The blue and white eggs are actually plastic eggs decoupaged with small pieces of blue and white fabric. They are very easy to make. I am so happy that you stopped by! I hope that you are enjoying your week! Happy Spring!!! Such a lovely Easter brunch you will have at this pretty table! Those chargers you created are fantastic and they look great with your dishes. Everything is so wonderfully coordinated with the pinks and blues. That bunny and wheelbarrow makes for a unique and fun centerpiece. I love the little extra touches like the berries in the napkin and the treats at each place setting. Happy Spring! Thank you, Lori, for the sweet and kind words! I hope that you are enjoying your week! Happy Spring!!! Your table is beautiful! I love those chargers! How creative of you, when you couldn’t find the ones you wanted for sale! I really enjoyed your story telling, how the bunny comes and hides the eggs that have been colored the night before. That wheelbarrow is adorable! Thank you so much for being a part of the tablescape blog hop, I always enjoy your pretty tables! 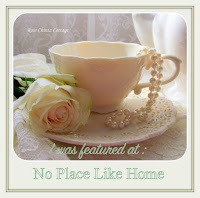 Thank you, Chloe, for the sweet comment and for hosting the blog hop! It is always so much fun! I hope you are enjoying your week! Happy Spring, sweet friend!!! Your table is lovely. Great use of those beautiful blue plates. I love what you did with the inexpensive chargers. Such a clever idea. The bunny is adorable and I love the white and blue napkins. Perfect choice for your charming table. How wonderful to be on this blog hop with you. Thank you, Janet, for the very sweet and kind words! It has been so much fun blog hopping with you! Happy Spring!!! Thank you,Kim, for the sweet and kind words! Happy Spring!!! What a cute table, so adorable puts a smile on my face. Thank you, Maria, for the sweet comment! I hope that you are having a wonderful week! Happy Spring!!! Shannon, what a delightful Easter table. The lace tablecloth is so pretty. Loving the charger plates you made over. The pink print is perfect for this blue and pink table. The bunny is so sweet, especially with the wheelbarrow. A pertable table to embrace Spring. Such a joy to join you on this fun hop. Happy spring. Thank you, sweet friend, for the very kind comment! It has been so much fun blog hopping with you! Happy Spring!!! Thank you, sweet friend! I hope that you are having a wonderful week! Happy Spring!!! What a lovely table! I would never have thought to put blue/white plates over pink flowered chargers but I love it. And the bunny with the basket of blue and white egg is the most perfect centerpiece. Thank you, Joy! Hope you are enjoying your day! Happy Spring!!! I like how you’ve incorporated the colors of spring into the blue and white. Altogether the table is quite joyful. Thank you, Linda! Happy Spring!!! That’s such a great idea to decoupage your chargers, I never would have thought of that. My mom had a collection of these same blue and white dishes. This post really makes me think of her and miss her. Lovely table! Thank you, Lory, for the very sweet and kind comment! I hope that you are having a wonderful week! Happy Spring!!! Adorable! I love using the Spode blue and white plates, and your little bunny with his cart of blue and white eggs makes the perfect centerpiece for your table. Great job! Thank you, Sarah, for such a sweet comment! I hope that you are having a wonderful week! Happy Spring!!! Your table is darling…especially that cute bunny! I love the plates!!! My eyes went first to the bunny and then to the plates. ha! Your creations are always so pretty. Happy Spring! Thank you, Sheila, for the very sweet comment! It has been so much fun blog hopping with you! Happy Spring!!! I really like your unexpected color combination for Easter! What a cute idea for the chargers! Thank you, Sandra, for the sweet comment! Happy Spring!!! Really enjoyed your story! Love your table and your creativity on the chargers! Great colors and lovely spring table! Thank you, Kim, for the very kind comment! Happy Spring!!! Shannon, This is such a colorful table! Those eggs are a perfect blue to the plates. Happy Spring! Thank you,Nancy, for the sweet comment! Happy Spring!!! I specially love the centerpiece. The bunny and carriage are adorable. Thank you, Fabby, for the sweet comment! Happy Spring!!! That’s so fun you are hosting Easter this year. I’m sure your family will really enjoy your table. Love that blue, the cute bunny, and those creative napkin rings! Thank you, Kathy, for the sweet and kind words. It has been so much fun blog hopping with you! Happy Spring!!! Enjoy your family time this year! I love your blue and white dishes and matching candlesticks! Thank you for sharing at Dishing It & Digging It! Thank you, Lori, for the sweet and kind words. Happy Spring!!! So pretty. I love the color combination! I have an apron made out of that fabric. I won it in a give away and I love it! The blue and white eggs are beautiful!! Thanks for sharing with SYC. Thank you, Jann, for the sweet and kind words! Happy Spring!!! So cute I love the wagon. Thanks for sharing at Monday Social.